This Crispy Lemon Cauliflower Sweet, sticky, savory, & crispy. Trust me it so delicious! 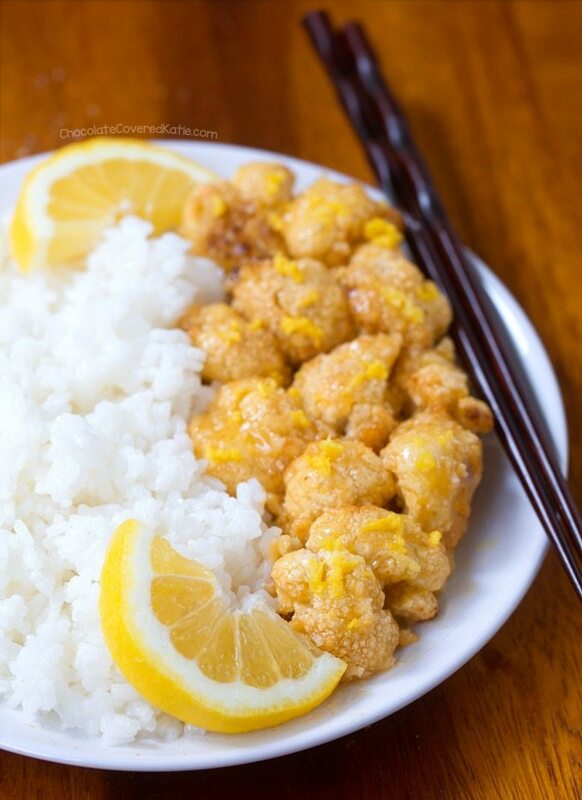 This crispy lemon cauliflower is my healthier, vegan answer to Chinese-restaurant lemon chicken. The sticky lemon glaze is absolutely addictive; and if you’re not feeling the cauliflower, you can easily opt to pour it over chickpeas, tofu, broccoli, or anything else you think would taste good with lemon sauce. Finely crush breadcrumbs, either in a blender (easiest method) or by placing them in a bag and crushing with a rolling pin or heavy object. Cut cauliflower into florets. Whisk milk, cornmeal, and oil, then toss with the cauliflower in a large ziploc. Put the cauliflower in a colander to drain off excess batter. Toss with the breadcrumbs. Arrange in one layer on a parchment-lined baking sheet. Bake 35-40 minutes. Meanwhile, make the lemon sauce by whisking together all remaining ingredients except cornstarch. Then quickly whisk in cornstarch. Turn heat to medium. Stir frequently – it thickens pretty quickly.